I wrote this in the weeks after Ulla's birth (in 2015!!) but never published it and now I'm weeks away from writing our next baby's birth story! I absolutely love reading birth stories- and I especially love the detailed ones!- so I included everything I remembered in this. If birth stories aren't your thing, maybe skip this one. Also, we didn't know what we were having (#teamgreen) but I use her/she throughout! 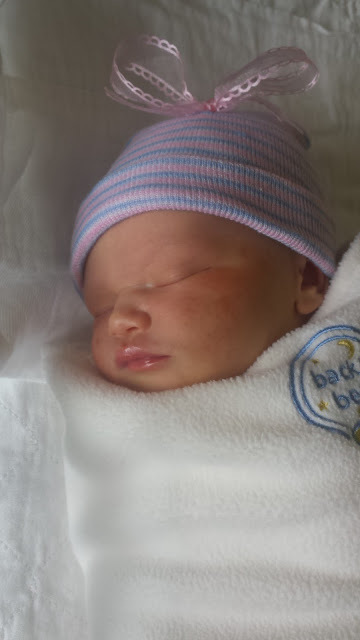 Ursula Joy was born on Monday, April 27, 2015 at 1:15 p.m. but her birth story started two days prior. Saturday marked 42 weeks in my pregnancy. I had been getting ultrasounds called Biophysical Profile (BPP) every two days that week, ensuring that everything was okay with both the baby and me since I was so far past my due date. I was certain she would come when she was ready, but carrying her was getting more and more mentally challenging for me. I worried constantly about her safety, and if I was making the right decision to wait. Most hospitals will induce at 41 weeks whether there are medical indications to or not, despite "normal" gestational being 38-42 weeks. On our way to our BPP on Saturday afternoon, John and I knew an induction was a possibility, even though I knew it was ultimately up to us. We both decided that if everything didn't look 100% perfect with the BPP, we would schedule an induction for that night rather than pushing it out any longer. During our BPP, everything look great except she didn't take any practice breathes. For thirty minutes, not one practice breath. Still, we got a passing score of 6/8 but it was a little unnerving to not see her "breathe" at all. (I would later find out that this reflex typically slows down or stops completely when labor is imminent, but I didn't know it at the time.) We went upstairs for the NST portion of our appointment, and she looked great on the monitors. When the midwives came in (we had two that day, and I loved them both), they said they would recommend admitting us that night and beginning the induction process, based on her 6/8 score. A physical examination revealed that I was not dilated at all but my cervix was 80% effaced. However, the baby had moved from a +1 station to a -1 station. In other words, exactly the opposite direction. This gave me a Bishop Score of 7, making me an okay candidate for induction and meant that I was probably in for a long labor. After discussing what the process would be, John and I drove home to get our things before returning to the hospital. We called our families and our doula to let them know what was happening. After checking in and getting settled into the room, the midwives came in to place Cervadil. The hope was that it would cause me to dilate overnight while I slept which would give us more options in the morning. 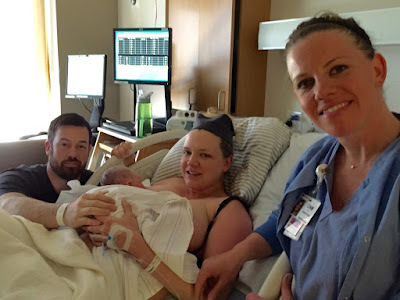 I did not sleep well at all, due in part to an uncomfortable bed, but mostly because I was having trouble letting go of the birth I had wanted, and managing the fear of the medical interventions I knew I faced. Despite getting induced, I still wanted as natural a birth as possible. Morning came with another cervical check, revealing that I had made ZERO progress overnight. None. Cytotec, an off-label use for a ulcer drug, was brought up. There's a ton of controversy surrounding it's use, mostly because once it's "in", there is no way to get it out or reverse its effects. The midwives assured me that the dosing protocol had changed since the horror story days of uterine hemorrhaging and amnio-embolisms. So I consented, and we got started with a 1/4 pill of Cytotec. Within an hour, I was having mild, yet regular contractions. I could talk through them, and ignored them for the most part. John and I ate breakfast and relaxed, waiting for my body to do its thing. Four hours later at 2 p.m., another check revealed I was a "tight" 1 cm! Progress! We again discussed options and decided that a second dose of Cytotec would be the best move. We called Joey to let her know what was happening, and told her that we would check in again around 6 p.m. that night, after the midwives came back to check my progress. Within an hour my contractions became two minutes apart, and too intense to talk through. They were lasting any where from 30-60 seconds. By 5 p.m. we called Joey and told her she better head our way soon. I needed the extra support. When the midwives came in to check me, they could see that I was in active labor and knew that I did not need a third dose of Cytotec. I also skipped a cervical check because I didn't want to be disappointed if there was a lack of progress. Before Joey even got there, I began vocalizing through contractions in the form of a low moan. It was almost impossible not to. I have vague recollections of our nurse pressing my hips or suggesting different laboring positions but for the most part, I kept my eyes closed and moaned through them. I had the option of laboring in water but didn't want to get in too early and stall labor. The next time the midwives came in, around 9 p.m., I wanted them to check me. I was a 3. THREE. After hours of super intense, super close contractions, I had only dilated 2 cms! The midwives said the tub wouldn't stall me since I had been in such active labor for so long. I got in, hoping that the water would relax me and make me dilate faster. At first the tub felt great. It relieved a ton of pressure and just the change in environment was a huge mental boost. John's mom came around that time, and I remember opening my eyes to see her. I have no concept of time, but after a while I was checked again, and had progressed to a 4. However, the baby's head had moved away from my cervix and without that pressure, they were worried I wouldn't continue dilating. I tried a few different positions in the tub to try to get her to turn again, but my contractions were getting more intense and lasting longer. I felt like I was starting to lose it. They had me get out of the tub to use the bathroom and I saw my bloody show. Finally! I don't know why but it made me excited, thinking that I was making progress. I also started to feel a ton of pressure, so they had me get on the bed to try a few pushes with contractions. That made everything worse. My contractions started coming on top of one another without a break. The pain got so intense that I couldn't inhale during a contraction, and started to hyperventilate. It was the first time I started to think about an epidural. I asked the midwife to check me, thinking that if I was in transition, that would mean that the pain was as bad as it was going to get and the end was sight. She checked and didn't tell me my progress, which I knew was a bad sign. I had to ask her a few times to tell me and she finally did. A stretchy 5. I started to say I need something, I need something but I was thinking I need to try something different. Joey asked me if I wanted something for pain. I told her no. After another few contractions, one right on top of the other, I said I wanted something. The nurse put in an IV and gave me something. It didn't do anything for the pain, but made me fall asleep in between contractions. During the next few, I asked them to call for the epidural. I think it was around 1 a.m. The anesthesiologist got there around 1:45 and what I was thinking in my head was Thanks for coming but what came out was I love you. He placed the epidural and told me to try to lay flat and still for the epidural to distribute evenly. Ten agonizing minutes later, it started to work. I sent my mom and Joey home to sleep, promising to call them as soon as there were any changes, and John fell asleep on the cot in the room. I, however, could not rest. A nurse came in to put in a catheter, and asked me if I had felt my water break. I couldn't feel anything, so I said I didn't know, but she said that the chuck pad beneath me had a fair amount of liquid on it, and it looked like it had some meconium in it. 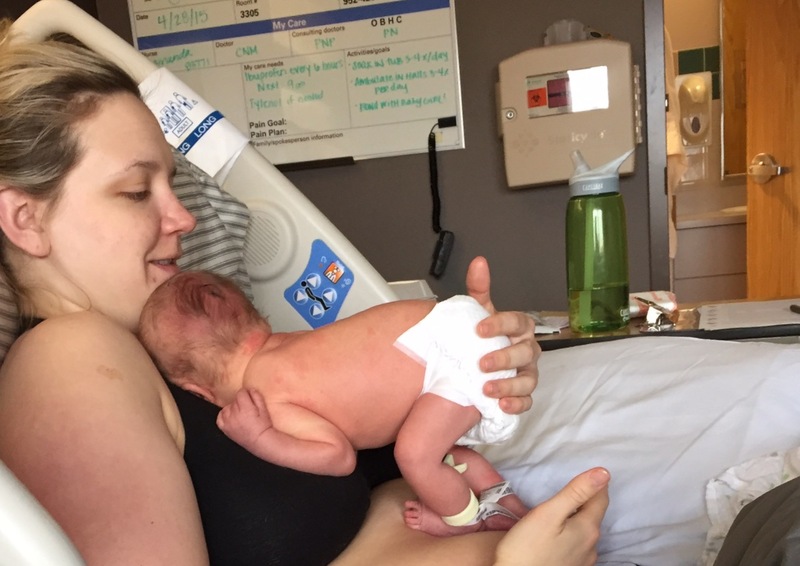 She said it would mean that the NICU team would be in the room during delivery, but if the baby cried right away, nothing would need to happen. Because of the epidural, my contractions had become irregular, now only 7-10 minutes apart, so they started pitocin. By morning, I think 7 a.m., the midwives checked me and I had progressed to 9.5 cm but my contractions were irregular again, so they starting upping the pitocin. By 10 a.m., I was 10 cm but they wanted the baby to rotate. Around Noon, they started to talk about letting me push but the midwives were in clinic so it took a while to get everything coordinated. Finally, around 1 p.m., my nurse gave me the green light to start pushing. She warned me that this being my first baby, and since I had an epidural, I would probably push for around 2-3 hours. Pushing was weird. I couldn't really feel my contractions so they were telling me when to push. I felt a ton of pressure in my face, like it was going to burst! It's such a weird feeling, and not something I was expecting. After just a few pushes, they could see the top of her head! The nurse told me to stop pushing because the midwife wasn't there. When the midwife got to the room a few minutes later, I was told I could push again while she suited up. Midway through my first push, I heard Stop! Stop! Stop! because her head was about to be born and my midwife wasn't ready. I stopped pushing but then someone said something funny and I laughed. And out popped her head, from the contraction of my laughter! I quickly pushed out the rest of her body, and she was born into John's hands, roughly 15 minutes after I had begun pushing. Her cord was short so they placed her on my stomach which was all the farther she would reach. I asked what she was and my heart exploded with surprise when someone said It's a girl! I don't remember much else about the time immediately after her birth because I was so overwhelmed with how much I loved her. They waited for the cord to stop pulsing and then cut it. I was finally able to bring her to my breast and she latched and nursed right away. I birthed the placenta at some point, and I needed stitches for a second-degree tear (so thankful for the epidural at that point!). We moved to a postpartum room a few hours later and spent the day cuddling her and introducing her to some family and friends. I cried a lot, mostly from disbelief that she was a girl! And from happiness. And hormones. already standing on those strong runner legs! The next couple days in the hospital were spent marveling over our baby girl. I don't think there was a minute where she wasn't being held. It took us a day and a half to decide on her name. Ursula was my late Oma's name (German for grandma). John had never met her and associated the name Ursula with a certain sea witch. :) My Oma went by Ulla (pronounced oo-la) and John liked that, so we decided on Ursula but call her Ulla. Joy is my sister's middle name and we figured she could always go by that if she wanted. We are so in love and she was so worth the wait.